This is a step by step Recipe for preparing at home tasty and delicious Noodle Omelet. This is a uncommon omelet recipe; nice surprise once in a while, especially for your kids. Mix the white of the Egg and Salt properly and then add the yellow of the Egg. Make the Omlette on a Non-stick fry pan. Spread the Noodles on the and fold it like the Maharashtrian Karanji in a triangular shape. 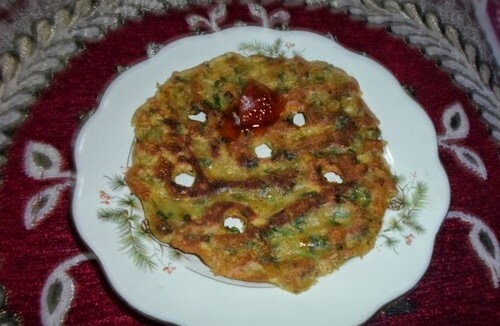 Decorate the Omelette with slices of Tomato and Shimla Mirchi. While serving, decorate at the side with slices of cucumber and boiled peas.